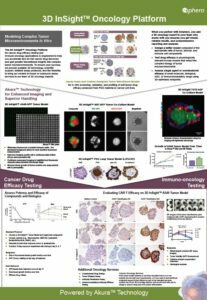 InSphero assay-ready 3D InSight™ Tumor Microtissues are designed to simplify and accelerate oncology drug efficacy testing. Using the 3D Select™ Process, our oncology experts have identified optimal culture conditions for large-scale, reproducible production of 3D spheroid models that better reflect complex tumor biology. N87-GFP tumor model in co-culture with NIH3T3-RFP fibroblasts. Our 3D tumor models are generated by self-assembly of tumor and stromal cells without the use of artifical matrices. We can produce monoculture or co-culture tumor microtissues using the cell lines and stromal cells listed here. 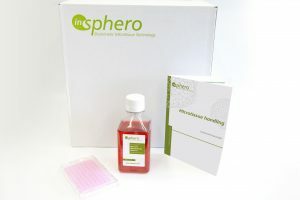 If you don’t see the cell line you need, we can build a custom model for you. 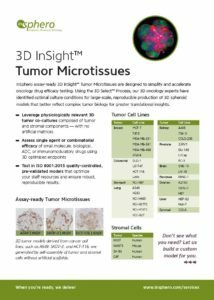 with 3D InSight™ tumor models.